Welcome to the first Chic Couture Fashion & Beauty Link Up! Thanks to all you who voted in the poll to add fashion to Birchbox Beauty Bash. Obivously the majority was yes and so I felt like a name change was in order. Fridays are Chic Couture days for me so why not name it that? We'll see how it goes! And don't forget Birchbox posts!! I still want to see those! Or any monthly club posts! 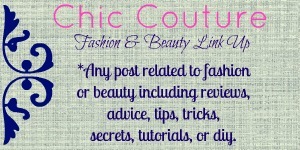 *Follow me via GFC, rss feed, or email and post the party button somewhere on your blog. As always the link will be open for a week! Can't wait to see your links! What a great idea for a link up! SUCH a great link-up idea, jennifer! i'm all linked and buttoned up!! thanks for hosting and sharing :) can't wait to see what everyone else shares! I am so excited to be able to share HERE! Thanks for hosting, friend! Thank you for hosting! Added my post and am following! I love it when I find new link parties! Thanks for hosting!